I've officially declared pizza as my single favorite food. If it made sense health-wise, I'd eat it at least three times a week. Thick crust, thin crust, homemade, pizza parlor, NY-style, Chicago-style... I just love the endless variations of chewy dough topped with cheese, sauce, veggies and sometimes meat. I've recently made some modifications to my BFF (in my head) Pioneer Woman's Pizza Dough recipe. I think I'm becoming a homemade pizza expert. I made a batch of dough at least once every ten days. 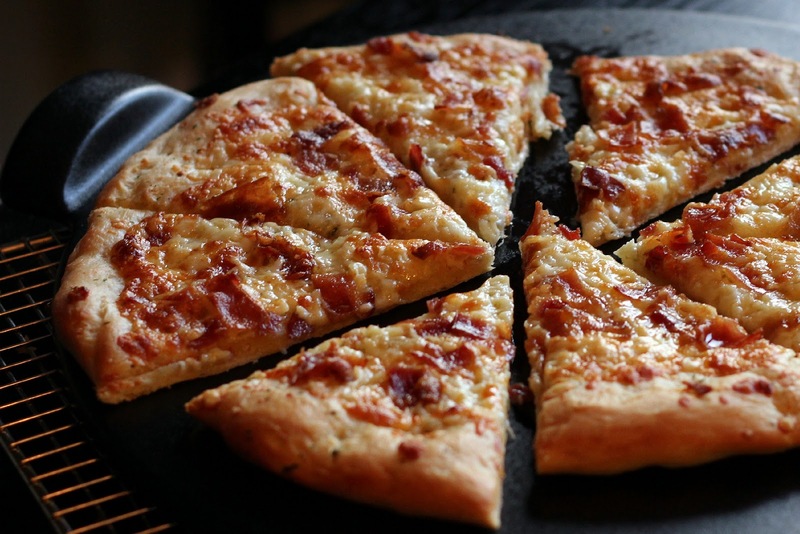 My latest creation is this White Pizza with Bacon that I wrote for ShopRite's Potluck blog. If you don't like bacon, just leave it out. I promise that the pizza will be just as delicious. This recipe calls for a flavored oil sold exclusively at ShopRite, but you could absolutely flavor your own oil with parsley, thyme and garlic to make this pizza if you don't live near a ShopRite. This pizza was so good that we ate it twice in one week. Give me this pizza with a salad and a glass of wine and I'm one happy woman. 'Nuff said. Pizza is also a great option for No Fast Food Fridays. That's right... first there was the Meatless Monday movement and now we have No Fast Food Fridays. I don't mind forgoing takeout when homemade pizza is this easy and tastes just as good. Yummmmmm! We make pizza every Friday night. I'll have to try this next time. You and I are on the exact same page. I had pita pizza for dinner last night and breakfast this morning. I freakin love pizza, in all it's varieties, but I still haven't gotten around to making dough--yet. This looks delicious, and it's just nonsense to leave out the bacon, that's the best part! Homemade pizza always looks and sounds so good, yet I've been scared to try it. Crazy, right? This white pizza with bacon may have changed that though. What did you use for the white sauce? @MrsTDJ, the "sauce" is actually just the light coating of flavored olive oil (I used a premade mixture of garlic, oil, parsley, and other herbs) and the cheese. It's lighter and full of flavor. Oh, this sounds and looks DELICIOUS! I just found your blog from the comment you left on mine. Nice to "meet" you! And, this pizza looks lovely!